Original Antique Maps and Prints. Description: This map originates from the 1613 edition of’Discrittione di tutti i Paesi Bassi’, by L. Guicciardini, published by J. At our website you will find a more extensive biography. Subject: Atrebatum Regionis vera Descriptio. This map shows Artois a part of France. The cities Calais, Cambrai and Lille are shown. Condition: Fine; general age related toning and light staining as visible on scan. Paper loss in top left corner and a few very small tears, not affecting image. Original middle fold as published. Actual sheet larger than pictured! Please study scan carefully. Size (in cm): The overall size is ca. 37.5 x 30 cm. The image size is ca. 31.5 x 23.1 cm. Size (in inch): The overall size is ca. 14.5 x 11.5 inch. 12.4 x 9.1 inch. Medium: Etching/engraving on verge type hand laid paper. ThePrintsCollector – Laurentius Old Master Prints Peter Cornelissen, Frans Laurentius, Joost Bos Margo van Latum-van Dongen, Frank van Latum Located in Zeeland (Noord-Brabant) – The Netherlands. GO TO OUR STORE and explore our huge collection of fine antique maps and prints. Powered by SixBit’s eCommerce Solution. 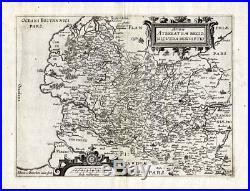 The item “Antique Map-FRANCE-ARTOIS-LILLE-Guicciardini-1613″ is in sale since Wednesday, June 6, 2018. This item is in the category “Antiques\Maps, Atlases & Globes\Europe Maps”. The seller is “theprintscollector” and is located in Zeeland. This item can be shipped worldwide.